Regardless of the genre, there’s an art to making a successful family feature. It involves crafting a storyline that’s straightforward enough to engage younger viewers yet sufficiently sophisticated that it keeps the attention of the parents and older siblings who accompany them. 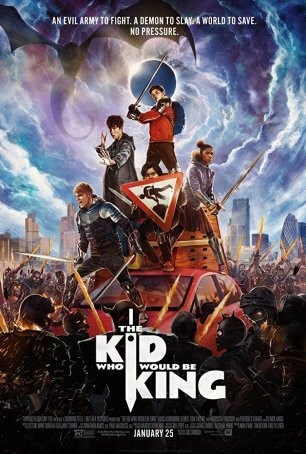 This peculiar alchemy eludes the filmmakers behind The Kid Who Would Be King, a fantasy-adventure inspired by Arthurian legends that, although perfectly entertaining for children in the age 8-12 bracket, may be a bore and a chore for adults. Superficiality is The Kid Who Would Be King’s greatest weakness. It skims along the surface, always taking the obvious path, never courting interesting possibilities, and trumpeting trite messages about friendship, truth, and belief in self. Those ideas are laudable but good movies find ways to integrate them into the subtext rather than having characters make speeches about them. The narrative, aside from running about 30 minutes too long, features only one mild surprise – and that doesn’t happen until past the midway point. The film’s views on bullying are also questionable since writer/director Joe Cornish’s (Attack the Block) screenplay, while condemning the actions, ignore consequences. The bullies become friends with their victims – something I have never seen happen in real-life when those victims often have to spend years in therapy. The best part of the film is an animated prologue that gives a condensed primer on Arthur, Merlin, Lancelot, Morgana, and the Knights of the Round Table. It then skips to present-day England, where 12-year old Alex (Louis Ashbourne Serkis) is defending his less aggressive friend, Bedders (Dean Chaumoo), from the taunts of Lance (Tom Taylor) and Kaye (Rhianna Dorris). A fight ensues and Alex, Lance, and Kaye are given detention. After school, the bullies decide to teach Alex a lesson but he escapes their pursuit in an abandoned worksite. There he finds a sword in a stone and pulls it free. Bedders half-seriously opines that it might be Excalibur – a supposition that gains traction with the arrival of a really weird kid named “Mertin” (Angus Imrie), who proves his claim to be Merlin the Magician but turning into an old man (Patrick Stewart) in front of their eyes. Merlin makes it clear to Alex that, as the true descendant of Arthur, the task rests on his shoulders to face the coming darkness. He must stand against Morgana the Sorceress (Rebecca Ferguson) and her hoards of undead demons when she attempts to rise from the underworld and lay waste to the land. Alex’s only allies are his “knights,” Bedders, Lance, and Kaye. Merlin’s capacity to help, it seems, is sporadic – like Gandalf in The Hobbit, he’s rarely around when needed. The story follows the beats of Young Fantasy Adventures 101. There are some exciting sequences where adequate special effects and Cornish’s flair for action choreography generate momentum. One such episode involves a chase through time-frozen streets with the four kids fleeing from three creatures that appear to have been inspired by the Black Riders in The Fellowship of the Ring. Overall, however, there are too many tangents and a false ending that promises a quicker exit from the theater than the full film demands. Two hours is too long for a movie this slight and more than a few kids were getting antsy at the screening I attended. The cast features the children of well-known movie personalities. The lead, Louis Ashbourne Serkis, is the son of Andy Serkis and Lorraine Ashbourne – he’s capable, talented, and does a good job playing the role of the reluctant hero. Young Merlin/Mertin is played by Angus Imrie, the son of British character actress Celia Imrie, and he has inherited his mother’s penchant for high energy, off-the-wall performances. To add a little veteran flavor to the young cast, Cornish has brought in Rebecca Ferguson, who gets to act deliciously wicked, and Patrick Stewart, who appears in three scenes where he looks like he came to the set straight out of bed without shaving. It’s not hard to imagine children enjoying The Kid Who Would Be King – it has been made with them in mind and, to the extent that directorial intent is the primary characteristic by which a movie’s success is determined, one can’t dismiss this production. Unfortunately, it’s not a destination picture for adults and even those with a penchant for fantasy will find themselves let down. The Kid Who Would Be King is less a family film than it is a kid’s feature, and the difference between the two is one reason why this movie is unlikely to make a major impact at the early 2019 box office.